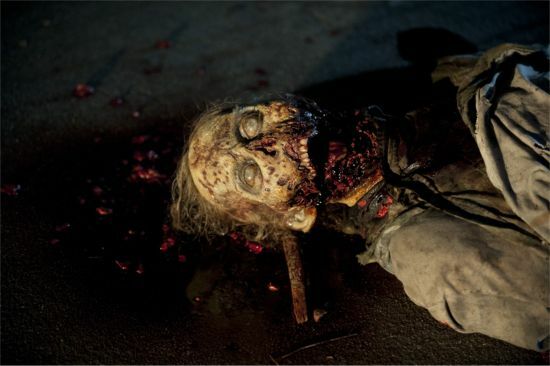 ‘The Walking Dead’ Season 4 Recap – Episode 5 ‘Internment’!! The last episode of the “Walking Dead” left us with Rick and Daryl’s group headed back to the prison. This episode showed the entire prison go to hell in hand-made wicker basket and back again, with a super huge surprise in the last scene. Lets get to it! Rick is driving back to the prison. He put the watch Carol gave him on the car seat next to him. You see wild dogs trying to eat half a zombie body and its pretty disgusting. Hershel, Glen and Sasha intubate a guy who is starting to suffocate. Hershel is joking around with other members of the council to lighten the mood after they do it. Hershel gives Sasha the bag and Hershel and Glen go on rounds to other people. They come across a cell with a dead body on it. Glen tries to stab it there and Hershel stops him. They are carrying bodies out without people seeing it. Izzie stops them and Hershel tells her to go read “Tom Sawyer”. That is her job to do during this. In a back room, Glen and Hershel talk about how neither of them have had to stab a body before. The body comes back to life and Glen stabs in with no problem. Hershel is shocked at this. Maggie and Hershel talk about Glen. She was there to see Glen and Hershel tells her that he is resting. Maggie wants to come in and help and he tells her no. Hershel asks about Beth and Maggie says that she is fine and tells him that he looks really tired. Hershel reassures Maggie about everything going ok inside the ward. He says that its hard in here, but they are holding it together. He tells her that Daryl and his group should be back soon and they will make it. He tells her to “Hold it together a little longer.” They say goodbye and Hershel walks back in. He passes Glen who thanks him for stopping her. He said if she saw him, she would not stay out. Hershel tells him to go lie down. It is at this moment that you realize a lot of this episode will revolve around Hershel. He really is showing his strength in all this. Hershel checks on a patient and sees Glen pumping the air in. Hershel goes to see Dr. K. He is very far gone and is now at the stage where “no one can come back from”. Dr. K made more IVs to help. Dr. K is telling him that people will start dying off one by one and then coming back one by one. He warns Hershel to keep the doors shut. Dr. K starts to cough and you see the blood coming out from his eyes and mouth. Hershel begins to close up all the cells and sees a man coughing on the floor in the middle of the cell block. He looks around at all the people looking at him and tells them to get back in their cells. Sasha grabs a gurney and they carry him away. He tells her to go rest in her cell. Hershel struggles in put the knife in the head of the man. he puts a sheet over his head and then does it. Rick comes up behind him and check up on him. Hershel is telling Rick that they are burning the bodies outside. behind the blocks. Hershel tells Rick that him and the dead man were talking about how a “Sad soul can kill quicker than a germ.” That is why he is not letting people see what is happening. Rick says that everyone is seeing him. Rick says that when they get past this, it will not be like it was. Hershel tells him that all of them got lucky with everything and that there is a plan or reason for everything. Rick asks if its a test and Hershel says that life is always a test. Rick then tells him about Carol. Rick has really grown to depend on Hershel and his advice. I know that is something happened to Hershel, Rick would go completely off the deep end. He might even kill himself. Hershel has become to go to rock for everyone else over the past season, also. Hershel walks away in shock and closes more cell doors. Hershel sees Sasha passed out on the floor in her cell. Next door to her cell is a pool of blood and a dead women coming back as a walker. Rick and Maggie are putting up wood beams and Maggie is talking about helping Hershel in the sick bay. After Maggie saves Rick from a walker, he tells her that he is glad that she is out there with him. Hershel brings Sasha back. She tells him that she does not know if she would be here right now if he wasn’t so “damn stupid.” Glen tries to revive the man they intubated. He then calls for Hershel and starts coughing really bad and choking on blood. Hershel is downstairs closing cells and he sees a boy laying down. 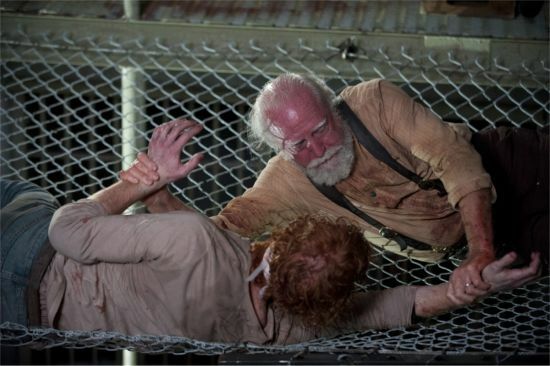 The father tells Hershel that he is sleeping and Hershel shuts both of them in the cell. Lizzie is upstairs and sees Glen. She calls her Hershel and the man gets off the bed and starts coming after her as a walker. This is when everything goes to hell…. Hershel is downstairs and the man he saw on the floor earlier is a walker and attacks him. 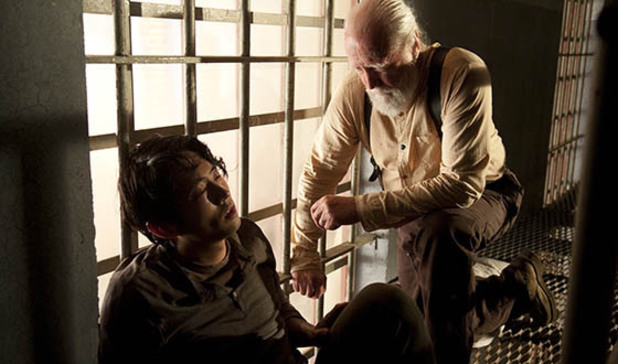 The father comes out of the cell with a gun and another woman goes to help Hershel. The man’s son, who is now a walker, goes and attacks his dad. The gun then goes off and shoots the alive woman who was helping Hershel. Maggie and Rick hear the gunshot and Maggie goes to help. Lizzie is luring the walker away from Glen upstairs while Hershel is dealing with the chaos downstairs. Rick goes and gets Carl to help him. Lizzie is still luring the walker and trips. Hershel saves her from it by flipping him onto the suicide fence behind the bars of the second floor. Maggie runs to the ward and uses an ax to try and get in. Hershel locks Lizzie and another young boy into a cell. He goes and checks on Glen. Dr. K has now become a walker, along with some other people. Hershel is running around putting out fires by himself. The people in the ward are turning one by one, just like what Dr. K said would happen. Its mass chaos and confusion. Rick and Carl are fixing the fence when the walkers FINALLY break it down and start coming in. Rick and Carl are now running for their lives. They get inside the main fence for safety. Hershel is getting armed inside, while RIck and Carl are getting armed outside. Rick and Carl now have machine guns and are shooting at the walkers and they break down another fence. Its the two of them again a mob of walkers and I sit and wonder where the tear gas and grenades are at. That would make it so much cooler if walker parts where flying everywhere. Hershel is now taking out walkers with a shotgun by positioning himself in a corner and shooting them one by one. Maggie shoots out the glass in the ward, which by the way seemed really easy for her to do. Glen is still laying on the floor choking. I am surprised that he is still alive. Hershel runs to the walker with the tube in his mouth. Maggie is under them as Hershel struggles and she shoots the walker. Maggie and Hershel gets the tube in Glens mouth and Glen survives. Its a freaking miracle. Hershel tells Maggie that he did not want her in here. She said she “had to, just like you.” Lizzie comes and asks if its over and Maggie says she hopes so. Rick and Carl are stabbing the heads of the remaining walkers. Daryl and his group come back at this point in the minivan. Ty runs to check on Sasha. Bob is getting medicine ready to give to Glen and others. 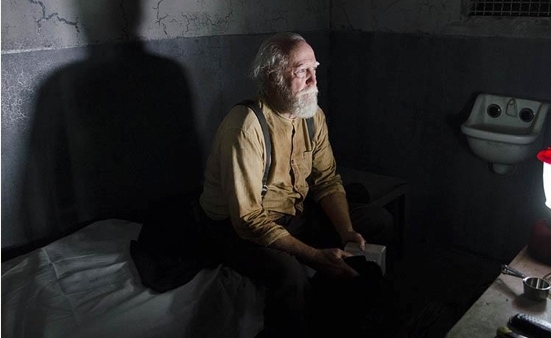 Hershel goes to Dr. K’s cell and has a break down. Hershel is holding his Bible during it. The next day Rick walks out of the prison cell. Michonne is pulling bodies to get rid of them. Rick asks if she needs help and she says “No. Do your thing.” Carl comes running out and gripes at him for not waking him up. Its almost identical to that first scene from the first episode with Rick and Carl. Ty asks Hershel about Glen and he made it through the night. Daryl asks about Carol and Hersehl tells him to talk to Rick about her. Michonne asks Hershel if he wants to come and burn bodies. Hershel says “Hell Yea.” Rick and Carl are going through the farm and ate some peas. Both of them are back in their peaceful place. Then you hear the music. The Governor is standing outside the prison fence watching Rick and Carl. I have said this from the first episode that he was not gone. You kinda waited to see if Carol was next to him. I wouldnt be surprised if he was the one getting in and feeding the walkers rats to sabotage the fence line. I also do not think that he is alone. This episode dealt with the issues inside and around the prison. Now the rest of the episodes will probably deal with the outside world and the Governor. Let me know what you think! ‘The Walking Dead’ Season 4 Recap – Episode 9 ‘After’!! ‘Walking Dead’ Season 3 Recap “Home”!!! This entry was posted on Tuesday, November 12th, 2013 at 12:29 am	and is filed under Comics, News, Television. You can follow any responses to this entry through the RSS 2.0 feed. You can skip to the end and leave a response. Pinging is currently not allowed. « Robert Kirkman’s Exorcism Drama ‘Outcast’ Lands at Cinemax !! !